This World Environment Day, City Square Mall, owned and managed by City Developments Limited (CDL), invites the public to do their part for the environment and be agents of change towards a sustainable future. True to its commitment as Singapore’s first eco-mall, City Square Mall’s Electronic Waste (e-waste) Recycling Programme encourages the public to go green and recycle their e-waste instead of tossing away unwanted electronic or electrical items. World Environment Day is the United Nations’ principal vehicle for encouraging worldwide awareness and action for the environment. Since establishment, it has grown into a global platform for people to realise their responsibilities towards the environment. This year, City Square Mall further reaffirms its support for the environment through its new recycling programme targeted at a growing concern of today’s society – e-waste. Battery chargers, cables, computer mice, desktops, docking stations, hard disk drives, keyboards, laptop, mobile phone batteries, mobile phones, modems, monitors, plugs, tablets and telephones. Blenders, electric fans, electric kettles, food processors and radios. The public can look forward to educational eco-related activities at City Square Mall, including an exhibition by National Environment Agency (NEA) between 5 to 6 July at B1 MRT Entrance. In a bid to raise awareness and educate the public on how to reduce their carbon footprint, the exhibition will highlight some tips for safeguarding our environment to ensure sustainable and quality living for present and future generations. There will also be eco-related games at the exhibition between 2 to 5pm on both days. 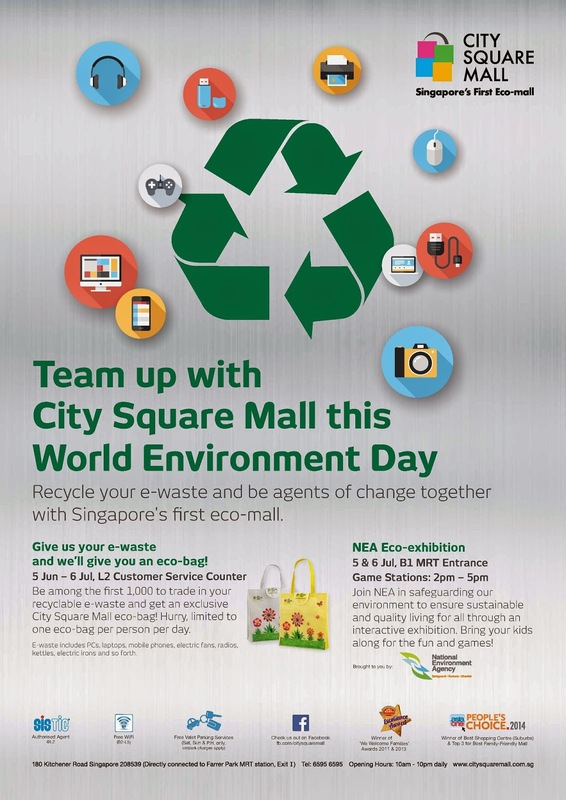 For more details on the E-waste Recycling Programme, visit www.citysquaremall.com.sg or check out City Square Mall’s Facebook page www.facebook.com/citysquaremall. City Square Mall is Singapore’s first eco-mall, located at the junction of Serangoon Road and Kitchener Road. Owned and managed by City Developments Limited, the mall has some 200 tenants that cater to the lifestyle needs of everyone in the family. Connected to Farrer Park MRT station, City Square Mall is one of the largest malls in Singapore with 700,000 sq ft of gross retail space, offering the perfect setting for the community to shop and play while acquiring an eco-learning experience. For more information on City Square Mall, please visit www.citysquaremall.com.sg. This advisory was issued on behalf of City Square Mall.